Graham will be performing at the opening of the Manchester International Festival 2017 at an event in Piccadilly Gardens, Manchester, on 29th June 2017. Created by the People of Manchester. Directed by Richard Gregory. In association with Islington Mill. From an idea by Jeremy Deller. This year’s Festival opens with an invitation – come to Piccadilly Gardens and join friends, neighbours and total strangers for this self-portrait of the city. As the working day ends on Thursday 29 June, MIF17 starts. All eyes will be on the people of Manchester as they become the opening event of the Festival. Raised high above the pavements, a unique selection of individuals from across Manchester will walk along a runway stretching more than 100 metres through Piccadilly Gardens. 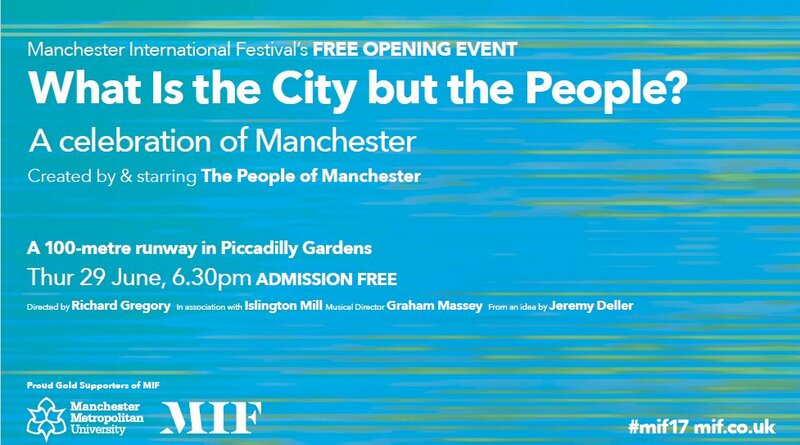 With live music from Graham Massey assisted by an unexpected mix of local musicians, What Is the City but the People? will capture and celebrate Manchester as never before. also this from BBC2 that uses some of the music. 808s NEW track 'Spiral Arms', comes in at 38minutes. The crowd really take to this. Fitting that Bez comes on the catwalk and dances to it.